Grid-based designs have been widely used in sectors such as graphic design, but they are now used in web design. These designs consist of a series of columns that allow organizing and structuring of contents (text, images, media) in an orderly and uniform manner. When the word grid is used, we usually think of the asymmetric grid where each small square has the same size. However, there are also other types of grids with each one having a specific use. For example, a grid based on diamonds patterns of design is usually used to give more movement to the elements that are placed in the design. In this article, we will talk about the vertical grid and how its use in your web designs can be beneficial. What is the vertical grid for? 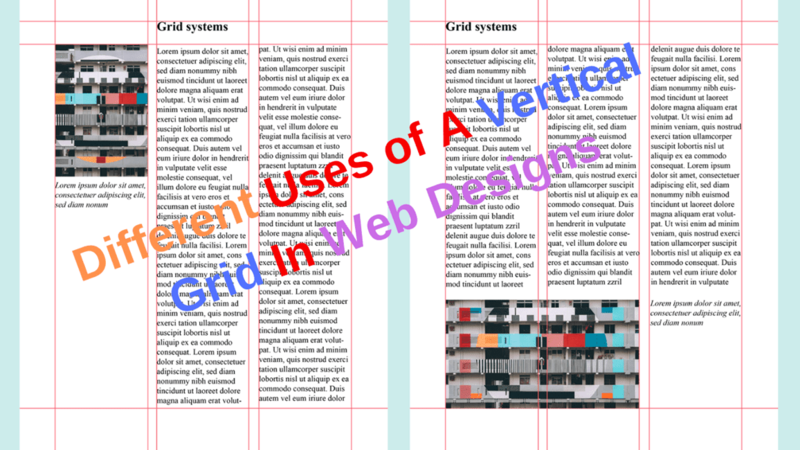 The vertical grids are used mostly in editorial design. Additionally, you can set the line size for your texts and thus have more control over the space used by each text box that you place on the page. In web design, a vertical grid also helps you to align your elements, as well as reach the rhythm in a composition. The vertical grid will also help you to establish certain rules for your design. This basic structure offers you certain guidelines to follow for the spacing, the location of the elements, the size, and alignment of the texts, etc. In other words, it helps you achieve a higher level of organization and create an adequate rhythm in the composition. This is beneficial for all types of users, but particularly for those who access the site from smartphones as they tend to do more scrolling to get to see the whole page. As a result, you get a web page with adequate spacing that is easy for the user to understand. Each element gets a space in the mind of the user and by maintaining a constant spacing, you can work in different sections without any disunity among the elements. When you see the design of all the sections, you can see that each of them is part of a whole. As we mentioned previously, vertical grids are used more frequently in editorial design where much of the content is text even though it is combined with images. Apart from considering vertical grids to be able to align paragraphs, it is also important to consider the baseline. This allows you to create rhythm in your composition and limit the paragraphs to a certain extent for each text box. We could make a comparison with the notebooks used by school children. They have horizontal lines that children use to calculate the height of the letters. In web design, these lines also exist. They are applied in an imaginary way to each text box in order to align them correctly. While the baseline serves to calculate the size of each line of text and the length of the text within its respective box, vertical grids are useful to be able to align paragraphs and create rhythm within your composition. Both elements are of great importance to organize the text of your website, so take them into account in your next projects. Ensure that you contact top web development companies for your web development projects. The card-based design is a current trend and you can create your own more easily if you use a vertical grid. Thanks to this grid, you can achieve an adequate spacing between each card. This, in turn, helps to delimit the theme of each card for the user. Now, everything depends on you placing the right content on each card to be able to make use of this popular trend on your website. Additionally, a more accurate vertical grid can help you find the right size for each element and correctly apply the typographic hierarchy on your website. The fact of using a grid does not imply that the final design should look like a grid if you do not want it that way. We know that it is a popular trend and a very useful style when working with online portfolios, but you do not need to adopt this style just because you work with a grid. The secret is to use the grid as a guide. The grid is often invisible to the user if properly used. Even though the user perceives the organization and alignment of the elements, thanks to these features, they can read the content fluidly but they do not see the grid clearly. Then, remember to use the vertical grid to organize the elements of your web page. Your users will be more than grateful if you do so. Using a vertical grid in the designs of your web pages helps you to align your elements, calculate the spacing and size of text, as well as to create rhythm in your composition which essential for your users to find some order and consistency in the webpage. Also, the rhythm is also used to embellish the composition, as the repetitions of elements can also have a decorative aspect. You have to understand the ways the different elements behave in the grids for an excellent design of your web pages. Ensure that you contact top web development companies for your web development projects. The graphic designing industry has been in the growing spur for a few years now, but till date amateur and even professional designers(Graphic Design Marketing) have to work extremely hard to find clients or projects those of which will cultivate heavy profit. The graphic designing industry has several professional techniques and tools that designers can utilize to attract clients. Example websites, newsletters, blogging, social marketing, content marketing et cetera. But if you are new to this industry then you will need a budget-friendly way to increase demand in this market of professionals. You can also opt for another option that is Virtual assistant graphic design or Graphic Design Marketing Tips, they provide amateur designers with strategies to improve their business. So you need to develop a social strategy which will assist you, here are a few tips which will come in handy for increasing your value. This is probably the most essential thing if you want to increase your demand in the market and succeed. Develop a strong portfolio which should include articulate work and it should also show how much effort you have put together while creating it. This tool will help influence your potential client and make them choose you. Various professionals of this field sign up in different online galleries or develop there own website which will display their artwork so that clients can look them up and contact you themselves. Don't forget this is a First task for Graphic Design Marketing. This might sound unimportant but it is an exceptionally significant procedure in today's digital world. A lot of people hire professional graphic designers even amateur designers if they find their works impressive. In this case, you don't have to always send your portfolio everywhere, you can just create your online account on social websites like Behance or showcase your work in other social networking websites. If clients like what they see then they will contact you themselves. But to impress them you need to understand a few things, always advertise your own expertise (do not copy), create contents those are easily understandable(It's a very important part of Graphic Design Marketing), also motivate people to opt for your service and even provide offers to enhance your business. You are advertising yourself as a graphic designer then it is extremely important for you to design your own Essentials. For example business cards, placards, newsletters et cetera. This(Graphic Design Marketing Tips) is necessary because people also judge your work through your own elements if you design your own things then you can also advertise them and work through them, it will serve both sides of the same coin. Focus on business cards as they are an important source of connection that you can establish with your clients, and if they like what they see then you might get an instant offer. Generally, designers are extremely busy they don't even have time to eat or sleep. so that is why they become detached from society. You cannot form concrete aspects and creative ideas if you are cooped up in a single room. That is why conferences and seminars on graphic designing is a potential supplement for designers they can develop productive contacts, and you can even interact with influential people. 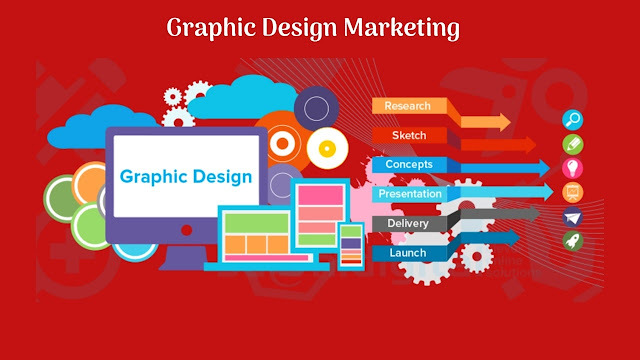 You can also learn about the trendy aspects of(Graphic Design Marketing) the graphic designing industry which will help them eventually in creating great contents. High-end businesses always normally receive a lot of spam emails and offer but if you want to be distinguished as an individual, and especially if you want them to focus on you then you need to think out of the box. Send handwritten professional letters with your sample products to your potential clients, they might consider Looking through your portfolio and samples. Handwritten and direct mails help a lot in Graphic Design Marketing. In this way, you may have a chance to showcase your work to these successful businesses than sending them through online services. Choose from custom made envelopes you can even design your own envelopes and send it in a way that will attract their attention because you may not be the only one who is actually thinking of this method there might be others and if you want to be chosen then you have to be more creative. It is extremely essential to be unique in the design industry but obviously, that doesn't mean you have to be extravagant or complicated. Find yourself a simple and unique concept and Practice through it. With time you will definitely make progress and clients will approach you for your work. Being unique is exceptionally important in the design world as there are hundreds and thousands of designers out there, but to make clients choose you within them will be difficult. Uniqueness is the sixth Graphic Design Marketing Tips. They might choose you if your work is not only creative but also enhances a different style then the general pattern. If you want to succeed in any kind of business then you need to think How You Can attract your clients and make them choose you as long as possible. So you can create a Loyalty program where your clients will receive reward points if they book orders. There are other ways where they can receive points like if they continue to book order and reach an estimated level where they might receive a free gift or their next order will be done free of cost or with a heavy discount. This is a last but not least Graphic Design Marketing Tips. Graphic Designing is a huge market in today's world and graphic designers are in demand everywhere. So to succeed in this field you need to think creatively in case of business too virtual assistant graphic design may also be another option. But you might work hard even if your designs are unique and extremely creative to find success, you need to advertise them and attract clients towards your business then only you will be able to achieve your milestone. Alex Jone is in an HR and Recruitment at Alliance Recruitment Agency- an IT Recruitment Agency. He specializes in helping with international recruiting, chef cook hiring, staffing, HR services, and Careers advice service for overseas and international businesses. Mobile developers are the people who make the most difference in the Android development industry. Let's discuss the core keys Advantages of React Native in details. This is a space which needs constant growth and improvement as the customers demand, more and more every time they look for an app online. The constant urge to optimize drives them not only towards the betterment of the apps that they create but also towards the process of working and workflows. The frameworks, tools, languages, and platforms available are ever changing, which make it a tough task to decide about the stability of them. Facebook had originally created React native for the creation of its own personalized mobile app, which only supported the iOs versions. Now, with the development of technology and efforts of a dedicated team alike, it is now able to create codes for android supported platforms also. 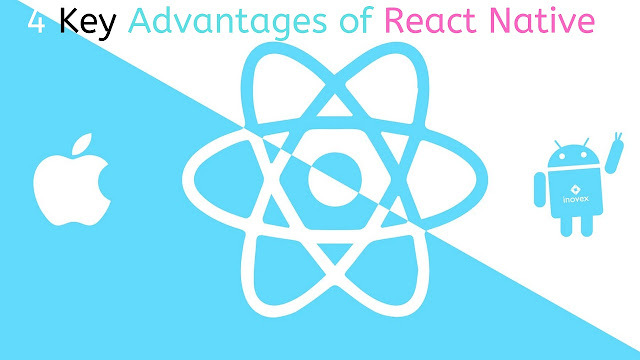 Since react native does not use review components and giving a friendly and quick, interactive user interface, it surpasses other hybrid mobile app solutions, thus standing at the top of providing a native language for coding. When compared to the previous hybrid technologies, React Native is super fast, since it is well tuned for mobile use and app development. This benefit is owed to the fact that React Native makes use of GPU(Graphics Processing Unit), instead of other native platforms, which are CPU(Central Processing Unit) based. Reach Native uses GPU for a strong performance this is an Advantages of React Native. Code Wilson is a Marketing Manager at AIS Technolabs which is Web design and Development Company, helping global businesses to grow by React Native Android. I would love to share thoughts on Social Media Marketing Services and Game Design Development etc. The Java development services have been progressing for many years and we can definitely see a huge rise in the future. 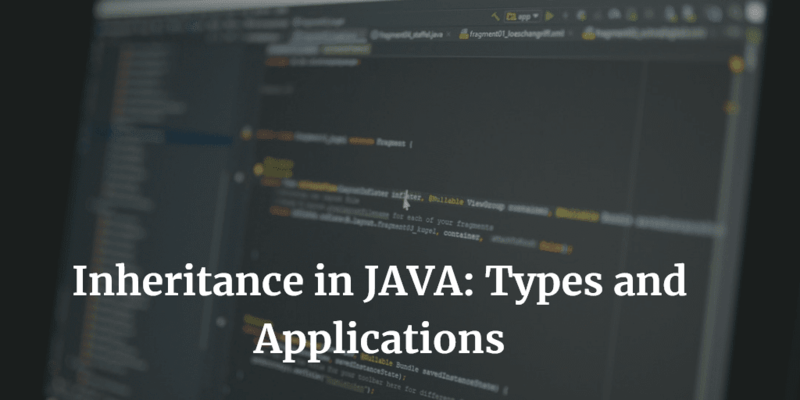 There is plenty of Java uses in your application; among them, inheritance is a process in which one object gains all the properties and behaviors of a parent object. Types of Inheritance in Java and the Applications of Inheritance in Java Language. We Are Going to Discuss Each and Single Details with the Help of Syntax, Examples, and Images. Inheritance is considered as a crucial part of the Object Oriented programming system. 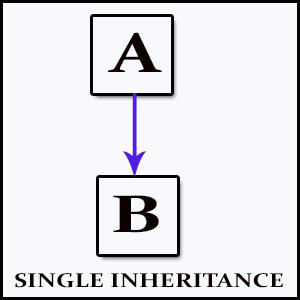 You may think about the application of inheritance in Java. Not to worry as we have got some quick summary of the Java inheritance and how to utilize it in your next project. Things to Remember: Parent or Super class for all classes are Object Class that is present in java.lang Package. The main idea behind the inheritance in Java is that you are allowed to create new classes upon the existing classes. By reusing the methods or fields of the parent class, you can inherit from an existing class and also add new methods or fields in your current class. Generally, the inheritance is known as a parent-child relationship that is represented by the IS-A relationship. There are duly two main reasons why you should opt for inheritance in Java. Let us look at the basic Java Inheritance. The Java inheritance also consists of few terminologies which is mostly used while inheriting the classes. Go through this given terms to understand the concept in a better way. Class -A group of objects that has common properties is defined as a class. Objects are created from a class. Child Class -A class which inherits the other class. Also known as a subclass, derived class or extended class. Parent Class -A class from where a subclass inherits the features. Also known as superclass or base class. Reusability -It is a mechanism that allows you to reuse the fields and methods of the existing class when creating a new class. You can also use the same fields and methods that are already defined in the previous class. Now, it's the time to dive in different types of Java inheritance along with its applications. Note: Java does not support Hybrid and Multiple Inheritance at class level because of the ambiguity problem. It is one of the easy inheritance to understand and implement as well. When a parent class gets extended by a child class then we call it a single inheritance. 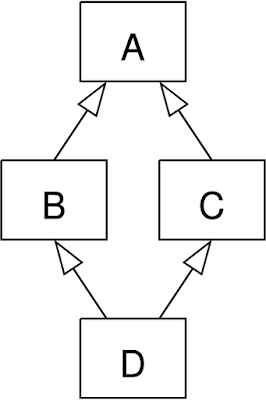 It is direct to direct connection defined as in the figure. 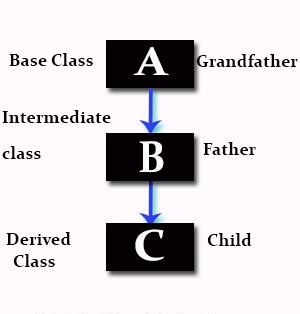 A mechanism in an object-oriented language where you can inherit from a derived class thereby making this derived class the parent class for the new class is defined as a multilevel inheritance. Hence, in Java, a class cannot directly access the members of the grandparents. 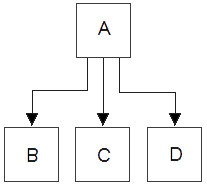 When one class is inherited by many subclasses, it is said to have a hierarchical inheritance. A better pictorial representation helps you to understand better. 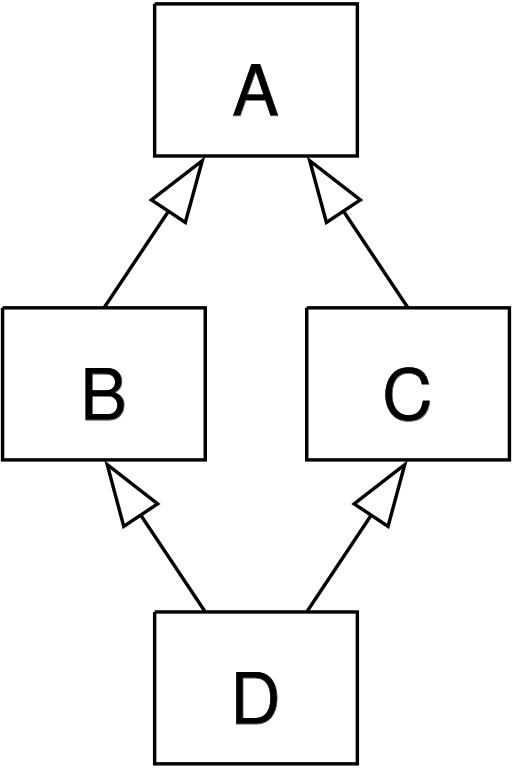 A hybrid inheritance is a combination of single and multiple inheritances as depicted in the below-given figure. It can be achieved in the same way as the multiple inheritances in java. With the help of interfaces, you can have multiple as well as a hybrid inheritance in java. When a child class inherits or extends more than one parent class, it is said to have multiple inheritances. There is an issue when it comes with multiple inheritances as the derived class will have to manage the dependency on two base class. It is mandatory to know that multiple inheritances are used very rarely in software projects as it can often lead to problems in the hierarchy. This might end up in unwanted complexity when further you want to extend the class. All of the new object-oriented languages like Small Talk, Java, and C# does not support multiple inheritances while it is fully supported in C++. Ava Barker working as a Technology Consultant at Tatvasoft UK which provides java development services in London. Coming from a technology background she likes to share her insights about development, design and more. She has also published her author bylines on many different publications online. Optimized UI/UX of a mobile app is the essential way to make a difference between your mobile design and the competitor's ones. Optimize Mobile Apps UI or User Interface by these 7 simple tips. Out of 3 million apps on play store and 2.2 million apps on the Apple app store, how you are going to stand top on the list?. The design of your app impacts its ease of use and performance across each stage whether Google's or Apple App Store. The user interface of your app characterizes the multifaceted nature a user should experience to comprehend the working of your app. To make an enduring impression on your users, we need to Optimize Mobile Apps UI. it is critical to creating a design that raises the user experience on your app. Here are seven mobile app design tips to Improve User Interface of Mobile Apps enables you to take your users' consideration. More straightforward, the better. This reality applies to textual styles additionally when we talk about little screens. In this way, a straightforward Sans Serif typography is the best choice for mobile apps. Additionally, the style has moved from slim text styles to great sort choices. This makes the navigation experience simple for end-users. Additionally, the thing to keep an eye out for is that albeit single words can be "All tops", like 'Foggy' yet, a total sentence ought to never be in "All tops" mode. Stark Typography helps to Optimize Mobile Apps UI. This meets up against a differentiating foundation which makes the general look very appealing. Security compliance issues are generally considered at a lot later phase of a project which prompts expanded project execution time. However, one should be proactive while designing UI and in this way, we can also get some quite support to Optimize Mobile Apps UI. He ought to counsel with the backend group about the correct arrangement of information being advanced. This guarantees a reduction in the expectation to absorb information of app users. One of the best designing trends this year is Material Design. This design pattern is trailed by Google moreover. Likewise, the navigation experience through this design is very agreeable. The most striking component of the material design is the production of Layers. Layers stack with little, common looking entities called shadows to separate components. The layers go about as interaction signs also. The base layer holds data while the best layer incorporates interaction tools. Layers and Depth are one of the best factors to Optimize Mobile Apps UI. The most recent trend is to utilize a single color with high contrast textual styles. This makes a ton of visual effect for mobile screens. While picking the only color to settle on splendid, intense, or bizarre colors. Monotone Color Schemes is very useful to Optimize Mobile Apps UI. You can likewise modify the color plan to be set by the user. This will add to his delight of utilizing the app. Small scale interactions are prompts that generally go unnoticed yet remain a fundamental piece of user interaction on specific apps. Small scale interactions enable the user to perform essential undertakings, e.g., enjoying a post via web-based networking media or sending a text message notification. The small scale interactions amuse the end-client. Card transformation has increased most extreme notoriety through its reception on sites, for example, Facebook and SoundCloud. Additionally, it is actualized as a piece of Material Design. Cards create and compose content in an effectively accessible way for Optimize Mobile Apps UI or User Interface. Each card is set up to complete an alternate assignment. In this manner, on the off chance that you are watching a video, the following tag in the line may connect to a through and through the various app. Everybody these days is trying different things with the concealed style of navigation to make utilization of each conceivable inch. The catch here is that the navigation component which is presently seen is highly functional and think about what! Users appear to appreciate this sort of navigation. You can likewise utilize flashes of activities as an additional touch. Activity adds to the excellence of an app by giving more pleasure to clients. Optimize Mobile Apps UI with the Straightforward Navigation and a touch of Animation. With these design tips for mobile apps, you can get the best from your app. Be that as it may, the design isn't the central part where you should deal with to get excellent outcomes from your app. To construct a useful mobile app, you have to specialists close by. 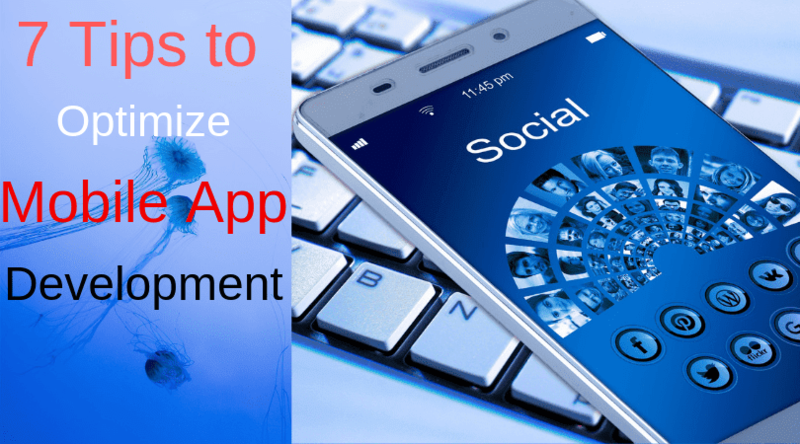 If you are searching for mobile game developers to design a convincing app for your business users that don't hesitate to get in touch with us: I hope these all 7 tips are helpful and Optimize Mobile Apps UI. Merry Waran is a Marketing Manager at AIS Technolabs which is Web design and Development Company, helping global businesses to grow by Ipad Game Development Company Services. I would love to share thoughts on Social Media Marketing Services and Game Design Development etc.